I TOOK A TRIP TO READING , PA. AIRPORT AND THE MID ATLANTIC AIR MUSEUM A FEW WEEKS AGO AND SPENT SOME TIME ON THE RAMP. I TOOK A FEW PICTURES OF THIS OLD BIRD, ONE OF MY FAVORITES. EAL operated their 4-0-4s in the eastern USA using the class name "Silver Falcon". 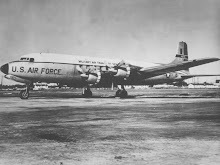 The first EAL schedule was flown on 5 January 1952 and retirement came in late 1962. SURE MISS THESE OLD BIRDS. ONE OF THE BEST RECIPS EVER MADE. The museum used to keep that 4-0-4 in airworthy condition and fly it to various airshows. I saw it at Sun & Fun a long time ago. It sure doesn't look airworthy now. The price of avgas probably had a lot to do with it. theses and other props. real adventure for a 19yr old ky kid..
One of those stupid things that will not erase from my memory. Max take off wt at MDW 43,650. I flew First Officer on 404's at Southern Airways in 1971. Our planes were purchsed from Eastern and had no autopilot because Eddie Riddenbacker did not believe in them. Wonderful aircraft to fly. National Airline Museum in Kansas City has one they are fixing up to be able to fly.